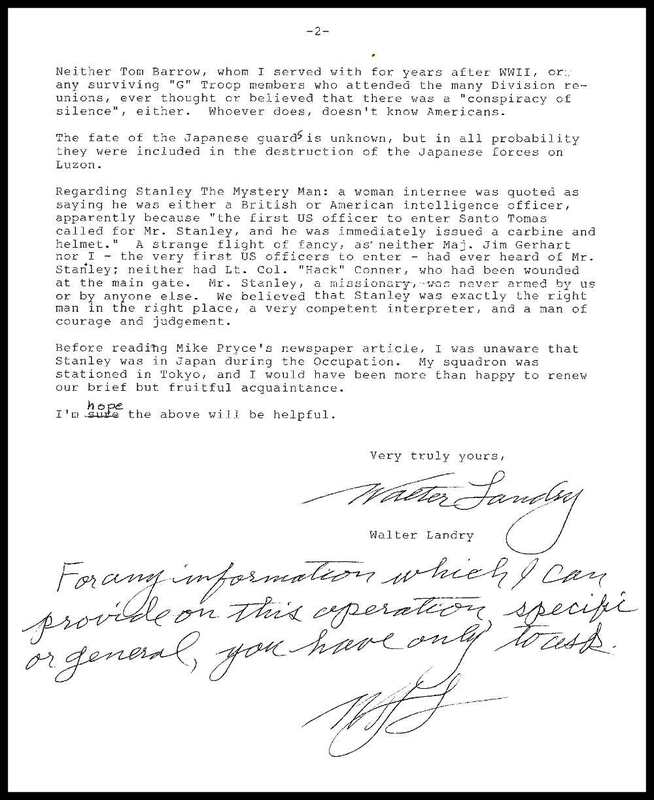 The following is a letter sent to Mr. Maurice Francis from Lt. Col. Walter J. Landry.... dated January 17, 2006. Col. Landry was an eyewitness to the rescue of Santo Tomas. He disputes several things that have been written concerning the rescue of Santo Tomas during WWII and Ernest Stanley whom he had contact with. If you wish to look at the actual document look at the two links below. When my unit, 2nd Squadron 8th US Cavalry, burst into Santo Tomas Interment Camp after dark on Feb 3, 1945, Mr. Stanley was crossing the plaza in front of the great main building, illuminated by our tank headlights. Col. Hayashi, the Camp Commandant, had heard the gunfire at the main gate, Recognized that it signaled the -unexpected! - arrival of American forces, and deputized Stanley to arrange the withdrawal of his guard force. As a result of several detachments, and an ongoing pitched battle at Far Eastern University, our strength at Santo Tomas was then not above 200 men. Our chief preoccupation at that moment was to secure the campus, and prepare for a likely counterattack. 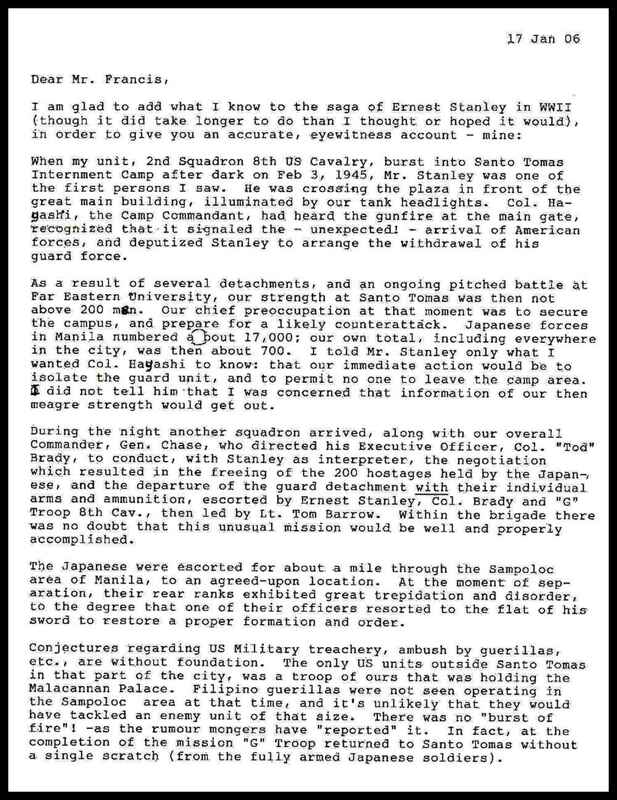 Japanese forces in Manila numbered about 17,000; our own total, including everywhere in the city, was then about 700. I told Mr. Stanley only what I wanted Col. Hayashi to know: that our immediate action would be to isolate the guard unit, and permit no one to leave the camp area. I did not tell him that I was concerned that information of our then meager strength would get out. During the night another squadron arrived, along with our overall Commander, Gen Chase, who directed his Executive Officer, Col. Tod Bradley, to conduct, with Stanley as interpreter. The negotiation which resulted in the freeing of the 200 hostages held by the Japanese, and the departure of the guard detachment with their individual arms and ammunition, escorted by Stanley, Col. Bradley and G Troop 8th Cav., then led by LT. Tom Borrow. Within the brigade there was no doubt that this unusual mission would be well and properly accomplished. The Japanese were escorted for about a mile through the Sampoloc area of Manila, to an agreed upon location. At the moment of separation, their rear ranks exhibited great trepidation and disorder, to the degree that one of their officers resorted to the flat of his sword to restore a proper formation and order. Conjectures regarding US Military treachery, ambush by guerillas, etc., are without foundation. The only US unit outside Santo Tomas in that part of the city, was a troop of ours that was holding the Malacannan Palace. Filipino guerillas were not seen operating in the Sampoloc area at that time and its is unlikely that they would have tackled an enemy unit of that size. There was no burat of fire (!) -as the rumor mongers have reported it. In fact, at the completion of the mission G Troop returned to Santo Tomas without a single scratch (from the fully armed Japanese soldiers). Neither Tom Barrow, whom I served with for years after WWII, or any surviving G Troop members who attended the many Division reunions, ever thought or believed that there was a conspiracy of silence. Either. Whoever does, doesnt know Americans. The fate of the Japanese guards is unknown, but in all probability they were included in the destruction of the Japanese forces on Luzon. Regarding Stanley the Mystery Man a woman internee was quoted as saying he was either a British or American intelligence officer, apparently because the first US officer to enter Santo Tomas called for Mr. Stanley, and he was immediately issued a carbine and helmet.. A strange flight of fancy, as neither Maj. Gerhart nor I the very first US officers to enter had ever heard of Mr. Stanley; neither had Lt. Col. Hack Conner, who had been wounded at the main gate. Mr. Stanley, a missionary, was never armed by us or by anyone else. We believed that Stanley was exactly the right man in the right place, a very competent interpreter, and a man of courage and judgement. Before reading Mike Pryces newspaper article, I was unaware that Stanley was in Japan during the Occupation. My squadron was stationed in Tokyo, and I would have been more than happy to renew our brief but fruitful acquaintance. I hope the above will be helpful. and Mr. Maurice Francis for making this document available. have been written concerning Ernest Stanley.